Tuesday marks the final day of the Mardi Gras season, which began on Jan. 6. See photos. Pete Fountain’s Half-Fast Walking Group was again a crowd favorite. The clarinetist died in 2016, but the walking group he led for years still meets each Carnival Season at Commander’s Palace restaurant and strolls the parade route. Lance Pierce, of Leonardtown, Maryland, got up early, ahead of friends, to see the group. Then the Zulu Social Aid & Pleasure Club paraded, followed by the Rex Parade. Zulu’s practice of wearing black makeup during its parade drew criticism amid recent national headlines that two Virginia politicians once wore blackface. Zulu issued a statement in February saying their parade costumes bear no resemblance to those worn by “blackface” minstrel performers at the turn of the century. Rather, the group said, the costumes are designed to honor garments worn by South African Zulu warriors. 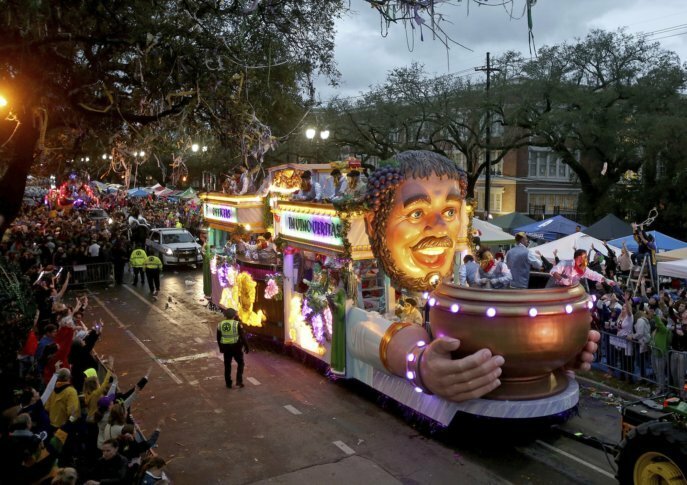 This year’s Carnival season also featured numerous jabs at the NFL and its commissioner Roger Goodell, over the now-infamous “no-call” during the Jan. 20 NFC Championship game between the Los Angeles Rams and the New Orleans Saints. NFL officials acknowledged flags should have been thrown. That’s done little to assuage Saints’ fans who chose to express their anger and disappointment in costume. The French Quarter was filled with costumed “blind referees” wearing signs like “Blind as a bat” or walking with canes. One parade featured a walking group called the “Robbin Refs” who wore referee outfits and black masks. On the back of their uniforms? A photo of Goodell with a red clown nose. The Krewe d’Etat parade featured a float called “Willful Blindness” with a blind referee on the front holding a cane. Fat Tuesday ends each year at midnight, with police riding horseback down Bourbon Street to ceremonially “clear” the street. Then comes Ash Wednesday, which marks the beginning of Lent and a time for many Christians to fast and reflect ahead of Easter.